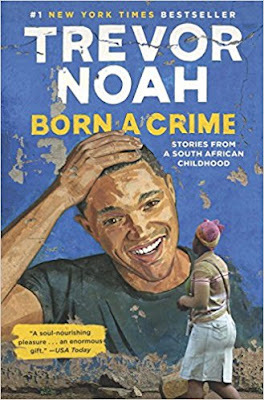 Trevor Noah grew up in South African during the end of apartheid. He was the son of a black mother and a white father, which - at that time - was a crime. His parents never were married, and he lived with his mother, but his father was always in his life. Trevor talks a lot about how it was growing up in a house with a strict mother who wanted him to have everything she didn't. Trevor was a mischievous young boy and young man who even spent a week in jail for petty crime. But he got out and made something of himself and he says he owes that all to his mother. This was a good book. Mat and I watch Trevor Noah nightly on Comedy Central. Now that I know his history and how he grew up poorer than poor in South Africa and what it was like to be half black and half white in a world that didn't know what to make of him. Today he identifies himself as a black man, but when he tried to enforce that identity as a young man, it backfired. I encourage you to read this book. Unlike most celebrity books I have read where the people had pretty decent childhoods and lives, this one was devastating to read. The stories are truly unbelievable.